Different surgical techniques are utilized to perform SDR. Neurosurgeons typically perform SDR after removing the lamina (laminectomy) from 5-7 vertebrae. That technique was also used at the St. Louis Children’s Hospital Cerebral Palsy Center to perform SDR on over 140 children with CP. However, we were concerned about possible problems that can arise from removal of such a large amount of bone from the spine. Additionally, because of the extensive removal of the bone, we could not offer SDR to children with weak trunk muscles or to adults. 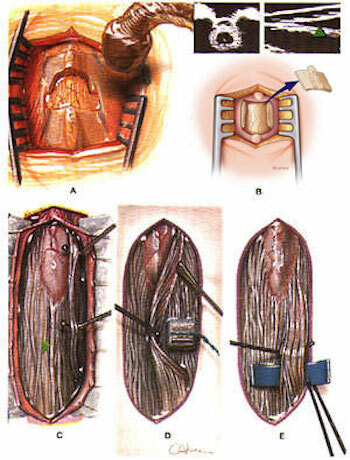 In 1991, we developed a less invasive surgical technique, which requires removal of the lamina from only 1-2 vertebrae. We refined the technique further and currently remove the lamina from a single lumbar vertebra (Figure A&B). SDR begins with a 1- to 2-inch incision along the centre of the lower back just above the waist. The spinous processes and a portion of the lamina are removed to expose the spinal cord and spinal nerves. Ultrasound and an x-ray locate the tip of the spinal cord, where there is a natural separation between sensory and motor nerves. A rubber pad is placed to separate the motor from the sensory nerves. The sensory nerve roots that will be tested and cut are placed on top of the pad and the motor nerves beneath the pad, away from the operative field. After the sensory nerves are exposed, each sensory nerve root is divided into 3-5 rootlets. 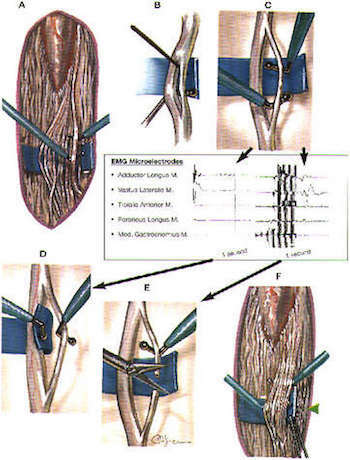 Each rootlet is tested with EMG, which records electrical patterns in muscles. Rootlets are ranked from 1 (mild) to 4 (severe) for spasticity. The severely abnormal rootlets are cut. This technique is repeated for rootlets between spinal nerves L2 and S2. Half of the L1 dorsal root fibres are cut without EMG testing. As a Training facility we work very closely with St. Louis and the team there. Dr Park has carried out SDR operations for over 25 years, and has trained numerous Doctors in how to Perform the modern SDR operation, since then we now have other facilities that offer SDR. Bristol, Leeds and Great Ormond Street Hospital London.